Anyone thinking of making their way to the Georgian capital of Tbilisi has made a good decision. At once historic and modern, the ever-changing city in the south Caucuses should not be missed and will likely have no trouble drawing you in with its many charms. Tbilisi is not a city to simply pass through, but to get to know better day by day, slowly exploring its many cafés, galleries, museums, bars, and charming old town. Intrigued? Read on for our guide to everything you need to know about visiting Tbilisi. Once you arrive at the airport, you can reach the city by taxi, train, or bus. Train: The train departs twice a day, in the morning at 8:45am and in the evening at 6:05pm, and a one-way fare is GEL 0.50. You can change money at the airport; there are several banks near the exit. The train connects the airport and Tbilisi’s central railway station, and the ride takes just 20 minutes. When you reach the central station you can catch a taxi to the city centre for around GEL 6-7. Bus: The public bus stop is located in front of the arrival hall and bus 37 travels between the airport and the city centre. The bus runs from 7am to 11pm at roughly 12-minute intervals. A one-way fare is GEL 0.50. Taxi: catch a 511 taxi (white Toyota cars) from stands in front of the exit. The price is approximately GEL 30. You won’t need transportation for visiting the old part of Tbilisi, as all the historical sites are very close together, within a few minutes’ walk. Otherwise, you can get around by minibus, bus, metro, and taxi. Metro: There are two metro lines in Tbilisi and if you plan to use it you’ll need to purchase a Metromani travel card, which costs GEL 2. You can add money to your card at each station and a trip, regardless of distance, costs GEL 0.50. Station names are written in English as well as Georgian, and train and station announcements are also bilingual. The metro runs from 7am until midnight. When you no longer need the card, you can return it to a metro cashier who will reimburse you the GEL 2 that you paid for the card if you show your receipt. Minibus: Called marshrutkas, Tbilisi’s minibuses are another option for getting around. There are no designated stops — simply flag one down when you see it coming. Destinations are indicated with numbers, so ask if it’s going in the direction you need before you hop in. Each journey costs around GEL 0.80. Bus: Tbilisi’s blue and yellow buses display a route number on the front and many bus stops have an automated board showing which bus is due next and how long it will be until it arrives. A trip costs GEL 0.50 and you can pay with exact change when you board, or use your pre-loaded Metromani travel card. If you decide to use the bus, you can use the route planner to help plan your trip. Taxi: Taxis can make for an easy way to get around within the city centre and only cost between GEL 3-4, but not all taxis are metered so agree on a price before you get in. Tbilisi’s old town is a great place to start your exploration of the city and is where you’ll find many worthwhile sights, including stately churches and historic monuments and fortresses. The maze of narrow streets hold surprises at every turn, even if it’s just a picturesque courtyard you can’t help but snap a few pictures of along the way. The old town was made for walking without a plan, since you really never know where you’ll end up, be it a tiny but welcoming wine bar, bakery, or a khinkali shop (khinkali are Georgian dumplings filled with meat and spices). Also in the old town, you’ll find the Abanotubani district, an entire street filled with public bathhouses that use the steamy, sulphurous waters of the area’s many hot springs. The bathhouses are underground — what you see at street level are brick domes all housing a subterranean spot to soak. Choose from the communal or private baths and settle in for a relaxing experience. Communal baths are cheaper and have separate areas for men and women, but everyone is in the buff — so if you’d prefer to disrobe with some privacy, a private bath is your best bet. Soak in the hot pool, relax in the sauna, and take a dip in the cold pool — then repeat. If it’s views you’re looking for, you’ll want to take a ride on Tbilisi’s cable car. The short but scenic ride gets you a panoramic view over the old town and Mtkvari River, and connects the city’s Rike Park with the must-see Narikala Fortress, which dates all the way back to the 4th century. The ride also puts you in close to proximity to the imposing statue of Mother Georgia (Kartlis Deda statue), and the National Botanical Garden of Georgia. The trip costs GEL 1 and you can use your metro card to pay for the ride. Tbilisoba is an annual festival in Tbilisi held in October and celebrated since 1979. During the festival, things get pretty lively and everyone is out for a good time. There are open-air concerts, cultural events, dancing, flea markets, and wine and food stalls if you need some fuel to help you keep going. Part history tour, part Home Cooked experience, this taste of Tbilisi’s got it all! We’ll show you just why Georgians are so famous for their hospitality with a home cooked meal (and glass of homemade wine) with a local family. 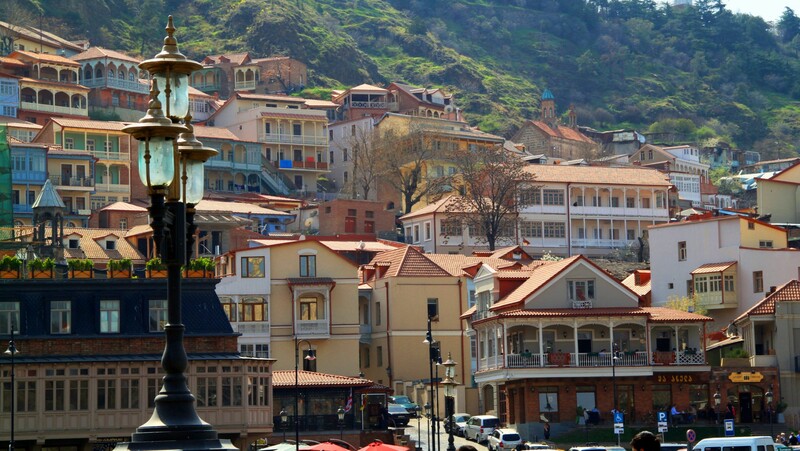 But before you eat, wander the streets of Tbilisi and hear the ancient tales that were born under your feet. One visit to historic Tbilisi and you won’t be able to get Georgia off your mind! We’re talking delicious foods, famous wines, ancient traditions, and Eurasian Silk Road charms — and we’re showing you all of it on this total Tbilisi tour that walks you through the city’s past and present. When you’ve been doing something for 8,000 years, it’s a good bet you know your stuff. And Georgia definitely knows its stuff when it comes to wine. Learn about the ancient qvevri wine-making method, dine on delicious barbecue and bread, and spend the day chatting with locals who know the best experiences are had with a glass in-hand. After the Soviet Union collapsed and Georgia became independent, the country had economic difficulties. The situation is described in the film In Bloom, about a group of 14-year-old girls, and their childhood in a run-down but still beautiful city. Watching the movie, you will find out more about what Tbilisi citizens have lived through. If you want to get a feel for Georgia before you touch down in Tbilisi, listen to some traditional Georgian polyphony, typically sung acappella by men, who are singing in at least three vocal ranges together. Check out an example here. Pack your bags with a few books to get you ready for your trip. A couple to consider include Please Don’t Call It Soviet Georgia by Mary Russell and The Making of the Georgian Nation by Ronald Grigor Suny. Looking for more info before you go? Contact us at info@tblisiurbanadventures.com. You can also follow us on Instagram for live updates straight from Tbilisi.